I was captivated from the moment I began reading this book, and finished it in two days. Tatlock's writing flows smoothly, and her character-driven plot moves at a perfect pace. This family drama set in the summer of 1969 in a small Illinois town with deep characters and issues was alluring, and I easily devoured every word. Eleven year-old Roz has just moved with her family back to her mother's hometown, away from her father who is an abusive alcoholic. Tillie Monroe shows up on their porch soon after, recently widowed and escaping from the nursing home where her son has placed her after he sold her house, the very house Roz and her family live in now. But Tillie claims it's her house and she will die in that very house she built with her husband. What follows is how Tillie finds her place within Roz's family, how they cope with their new life and most of all, how Roz is affected by a father who wants to come back into her life. Told from Roz's point-of-view, Tatlock effortlessly captures the innocence, beauty and frailty of childhood and loss. Through her friendship with Mara, a black schoolmate, Roz shares her hopes and fears, and the reader cannot help but be transported along with both girls as they yearn for what seems beyond their reach. As parents, we get a young girl's perspective of fatherhood. It is a coming-of-age story filled with courage, love and sadness; a story about the true meaning of family. A story to savour and reflect upon. 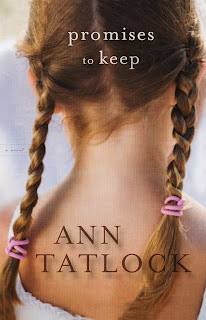 This is the first book I read from author Ann Tatlock, and I am now a fan. If you are looking for a heartwarming but quietly suspenseful family drama, I highly recommend this book. Disclosure: Thanks to Bethany House for sending me this book for review. I was not compensated in any other way, nor told how to rate or review this product. This does indeed sound wonderful! That sounds like a powerful book. I've never read a book by her, but this one sounds good! I thought this book sounded good also. I'm thinking it would be a perfect summer read.Thanks for the great review. I have been hoping to catch a review for this book. I am now following you. Thanks so much. I have this one for review myself, so I only read your first paragraph! (I don't usually read other reviews prior to reading a review book myself), but that was enough to let me know that I have something to look forward to! Thanks so much!